9x13 Baking Pan Lids | Personalized Baking Lids | That's My Pan! Purchase additional 9x13 baking pan lids to keep your cake pan in season! 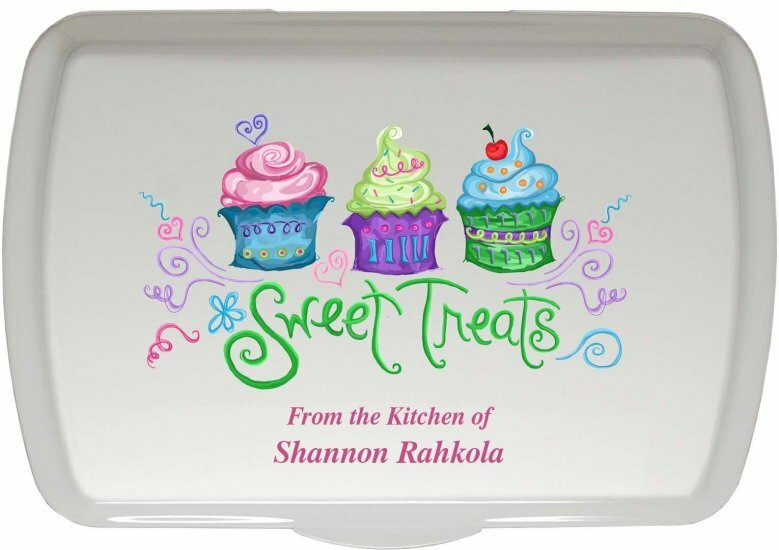 These personalized baking lids only work with our 9x13" Traditional, 9x13" Non-Stick, 9x13" Bar Pan or 9x13" Doughmakers® Pans. 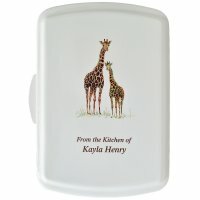 Custom Giraffe design lid. These only work with our 9x13" Traditional, 9x13" Non Stick, 9x13" Bar Pan or 9x13" Doughmakers® Pans. Custom Penguin design lid. These only work with our 9x13" Traditional, 9x13" Non Stick, 9x13" Bar Pan or 9x13" Doughmakers® Pans. Custom Sloth design lid. These only work with our 9x13" Traditional, 9x13" Non Stick, 9x13" Bar Pan or 9x13" Doughmakers® Pans. Custom Sweet Treats design lid. These only work with our 9x13" Traditional, 9x13" Non Stick, 9x13" Bar Pan or 9x13" Doughmakers® Pans. Custom Wheelbarrow Flowers design lid. These only work with our 9x13" Traditional, 9x13" Non Stick, 9x13" Bar Pan or 9x13" Doughmakers® Pans. Custom Tree of Love design lid. These only work with our 9x13" Traditional, 9x13" Non Stick, 9x13" Bar Pan or 9x13" Doughmakers® Pans. Custom Heart Vine design lid. These only work with our 9x13" Traditional, 9x13" Non Stick, 9x13" Bar Pan or 9x13" Doughmakers® Pans. Custom Home Sweet Home design lid. These only work with our 9x13" Traditional, 9x13" Non Stick, 9x13" Bar Pan or 9x13" Doughmakers® Pans. Custom Owl Couple design lid. These only work with our 9x13" Traditional, 9x13" Non Stick, 9x13" Bar Pan or 9x13" Doughmakers® Pans. Custom Owl design lid. These only work with our 9x13" Traditional, 9x13" Non Stick, 9x13" Bar Pan or 9x13" Doughmakers® Pans. Custom Proud American design lid. These only work with our 9x13" Traditional, 9x13" Non Stick, 9x13" Bar Pan or 9x13" Doughmakers® Pans. Custom Baking design lid. These only work with our 9x13" Traditional, 9x13" Non Stick, 9x13" Bar Pan or 9x13" Doughmakers® Pans. Custom Ballerina design lid. These only work with our 9x13" Traditional, 9x13" Non Stick, 9x13" Bar Pan or 9x13" Doughmakers® Pans. Custom bear in a birch forest design lid. These only work with our 9x13" Traditional, 9x13" Non Stick, 9x13" Bar Pan or 9x13" Doughmakers® Pans. Custom Cake Celebration design lid. These only work with our 9x13" Traditional, 9x13" Non Stick, 9x13" Bar Pan or 9x13" Doughmakers® Pans. Custom Mermaid design lid. These only work with our 9x13" Traditional, 9x13" Non Stick, 9x13" Bar Pan or 9x13" Doughmakers® Pans. Custom Picnic design lid. These only work with our 9x13" Traditional, 9x13" Non Stick, 9x13" Bar Pan or 9x13" Doughmakers® Pans. Custom Spring Bunny design lid. These only work with our 9x13" Traditional, 9x13" Non Stick, 9x13" Bar Pan or 9x13" Doughmakers® Pans. Custom Utensils design lid. These personalized pan lids only work with our 9x13" Traditional, 9x13" Non Stick, 9x13" Bar Pan or 9x13" Doughmakers® Pans. 9x13" designer series cake pan cover only. These casserole dish lid only work with our 9x13" Traditional, 9x13" Non Stick, 9x13" Bar Pan or 9x13" Doughmakers® Pans. 9x13" traditional lid with a textured cranberry finish lid. These only work with our 9x13" Traditional, 9x13" Non Stick, 9x13" Bar Pan or 9x13" Doughmakers® Pans. 9x13" traditional lid with a textured navy blue finish lid. These only work with our 9x13" Traditional, 9x13" Non Stick, 9x13" Bar Pan or 9x13" Doughmakers® Pans. 9x13" traditional lid with a smooth purple semigloss finish. These only work with our 9x13" Traditional, 9x13" Non Stick, 9x13" Bar Pan or 9x13" Doughmakers® Pans. 9x13" traditional lid with a smooth turquoise semigloss finish lid. These only work with our 9x13" Traditional, 9x13" Non Stick, 9x13" Bar Pan or 9x13" Doughmakers® Pans. 9x13" traditional lid with a smooth ruby semigloss finish lid. These only work with our 9x13" Traditional, 9x13" Non Stick, 9x13" Bar Pan or 9x13" Doughmakers® Pans. 9x13" traditional lid with a textured forest green finish lid. These only work with our 9x13" Traditional, 9x13" Non Stick, 9x13" Bar Pan or 9x13" Doughmakers® Pans. 9x13" traditional lid with a textured black finish lid. These only work with our 9x13" Traditional, 9x13" Non Stick, 9x13" Bar Pan or 9x13" Doughmakers® Pans. 9x13" traditional lid with a smooth charcoal gray semigloss finish lid. These only work with our 9x13" Traditional, 9x13" Non Stick, 9x13" Bar Pan or 9x13" Doughmakers® Pans. 9x13" traditional lid with a Penny Vein Hammered Metal Look finish lid. These only work with our 9x13" Traditional, 9x13" Non Stick, 9x13" Bar Pan or 9x13" Doughmakers® Pans.